Dell makes seriously excellent computers, and were it not for the nettlesome process involved in actually obtaining one, we’d likely own more of them. The previous occasion of our doing so – and thereafter spending several turgid weeks in Dell hell while our order was lost, found, charged, uncharged, lost some more and finally delivered way later than we’d been promised – caused us to vow that Dell hell would freeze before we bought another Dell system. We recently decided that sufficient time had elapsed to give the dudes of Dell another chance, on the assumption that they must have smartened up as they’d have long since put themselves out of business were it otherwise. We needed a new desktop computer, Dell was having a sale and there was magic in the air. The exact nature of the magic in question remains a subject of some debate. The Dell OptiPlex 3020 is an unadventurous black box that runs Windows – pretty much everything we could have asked for in a desktop system. The sale we bumped into at Dell’s labyrinthine web page offered it with Windows 7. We’re hugely in favor of Windows 7, in that Windows 8, the operating system with which most contemporary desktop machines ship of this writing, often feels like a disaster best measured on the Richter scale. While the configuration of the OptiPlex 3020 offered at Dell’s sale page had a more powerful processor than we needed and a higher price than our budget would allow for, our earlier experiences with Dell suggested that they’d probably flex this if we chatted with one of their staff. This proved to be the case – the Dell salesperson banging away at a keyboard, perhaps on the far side the planet, got back to us with a slightly reduced configuration – an Intel Core i3 processor rather than the original Core i5 – and a more competitive price. We’d have bought the machine the next day… save that all our subsequent e-mail messages to our inside source at Dell remained unanswered. It took several days to get in touch with her supervisor, who assigned our transaction to a new staff member. We never did find out what happened to her – perhaps she’d never actually existed at all. Our new Dell salesperson was articulate, helpful and didn’t evaporate before we could provide him with a credit card and close the deal. We were subsequently availed of e-mail messages from Dell confirming the configuration of the computer, the terms and conditions under which we were purchasing it – with language to the effect that by having received the message they were sent as attachments with, we were bound by same – and at some length, tracking information. Our new Dell computer came with free shipping… which for those of us over seven years old and not born on a planet with a purple sky means that the cost of shipping the system to our offices was built into its purchase price. Despite the fact that we were in fact paying for the shipping, Dell dispatched our new computer using what might charitably be described as the least reliable logistics company in Canada not run exclusively on dog sleds. Our lawyers would launch themselves into low Earth orbit were we to name them, and then we’d have to shop around for a whole new set of lawyers, so we won’t. Our OptiPlex 3020 didn’t arrive when it was scheduled to do so. It probably spent substantially more time in transit than it did being built. The courier company’s tracking page determined with a high degree of reliability that it never technically left North America, but for a while that was about as close as they came to locating it. After lots of incandescent frustration, we tried contacting Dell, under the assumption that having employed the courier in question, they’d enjoy more success at getting them to deliver our missing hardware than we had. We received a wealth of corporate-speak which clearly translated into “we can keep this up until the sun goes cold…” but no meaningful assistance. The computer eventually found its own way out of the Twilight Zone. 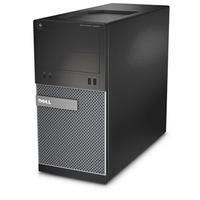 Our OptiPlex 3020 is a nicely engineered and flawlessly assembled system. It’s impressively quick, and it has proven to enjoy the stability of the Precambrian rock that our digs are built atop. As with our previous Dell system, it lacks a traditional four-pin power cable to light up our preferred choice of storage devices – for which we are ill-disposed to fault it, as the adapter to work around this deficiency costs about eight dollars from Amazon. Our new system features eight USB ports – a decidedly generous allotment – with two up front for easy access. Oddly, only two of them support the faster USB 3.0 protocol, and they’re at the back of the case, where they’re pretty much inaccessible for casual use. Other notable interface options include an HDMI video connector, in addition to a conventional VGA monitor jack, to allow the system to drive a high-definition video monitor. The case of the OptiPlex 3020 is somewhat less elaborate than its predecessors, with two screws affixing the side panel to it, rather than one of the elaborate mechanical locks that Dell seemed to favor for decades. This is likely to be of fleeting concern for most users of this machine, as there’s rarely much call to get inside computers any more. Most notably for us, it offered a spare drive bay with no funky plastic doors guarding it, which allowed us to install a removable hard drive rack. The motherboard of the OptiPlex 3020 has no PCI expansion slots, although there are slot openings in the system case. A few years ago, this would have been a serious shortcoming. A few years from now, no one’s likely to remember what these things were once used for. This is the first computer we’ve ever bought – outside of a few inveterate purchases at yard sales – that didn’t come with a single word of printed documentation. We eventually found a somewhat terse downloadable PDF manual for it at Dell’s web page, but you really would need to know where to look for it. Our OptiPlex 3020 also lacked a Windows 7 installation CD-ROM. Windows 7 was installed on its hard drive, but had we encountered the need to reinstall it in the future, we would have been toast. Dell’s technical support department proved entirely disposed to sending us one, as well as an expertly compiled CD-ROM of hardware drivers for the system, both at no cost… but you’d need to know to ask for them. Upon consideration, Dell’s sales and support people have arguably improved somewhat since our earlier encounter with them… or perhaps we’ve grown older and more patient. Nothing got thrown during this transaction, no hand-stitched Michael Dell dolls were impaled with pins and a plot to punish Dell’s courier with silly string and a box of spiders never really made it out of the planning stage. It all bore aspects of a descent into Dell hell, but it was to a lesser circle occupied by far more contemplative demons. We’ll call it a marked step toward enlightenment.